Good Morning, this is Capital Essence’s Market Outlook (the technical analysis of financial markets) for Friday August 31, 2018. Stocks closed lower Thursday on report that Donald Trump told aides he supports moving forward with proposed tariffs on an additional $200 billion in Chinese goods. For the day, the Dow Jones Industrial Average fell 0.53 percent to 25,986.92 while the S&P fell 0.4 percent to 2,901.13. The Nasdaq Composite declined 0.3 percent to 8,088.36. The CBOE Volatility Index (VIX), widely considered the best gauge of fear in the market, rose to its highest level since August 17, surged more than 10 percent to close at 13.53. Frontier-market stocks fell broadly on Thursday as a stronger dollar sent commodities prices down sharply. Gold slid below key support of $1,200 an ounce. Silver fell 1.2 percent at $14.54 an ounce. Platinum lost 0.7 percent at $790.49 per ounce. 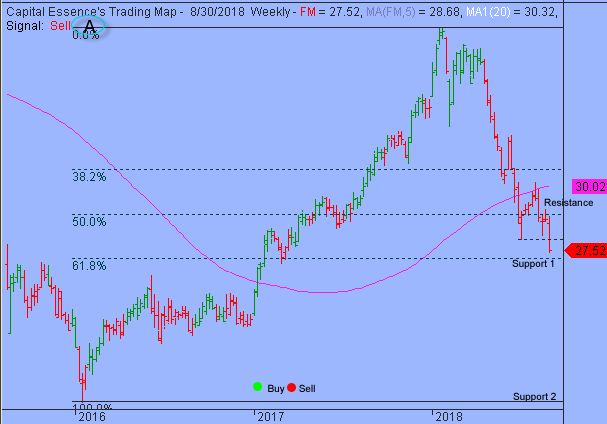 The iShares MSCI Frontier 100 ETF (FM) dropped 2.93 percent to 27.52, down nearly 17 percent YTD while the S&P gained 8.5 percent over the same period. Now the question is whether this week selloff is a beginning of an end or there’re more pains ahead? Below is an update look at a trade in FM. Our “U.S. Market Trading Map” painted FM bars in red (sell) – see area ‘A’ in the chart. The first dominant feature on the chart is the rising trend starting in early 2016. The second dominant feature of the chart is the downward trend since late 2017. Over the past few weeks, FM has been trending lower after the July counter-trend rally found resistance at the 2-year moving average. This week’s massive selloff pushed the ETF below the July low, signify resumption of the late 2017 downswing. Over the next few day, traders should monitor trading behavior as the 61.8% Fibonacci retracement, around 27, is tested as support. A close below that level will bring the 2016 low, just below 22, back into view. FM has resistance near 30. Short-term traders could use that level as the logical level to measure risk against. 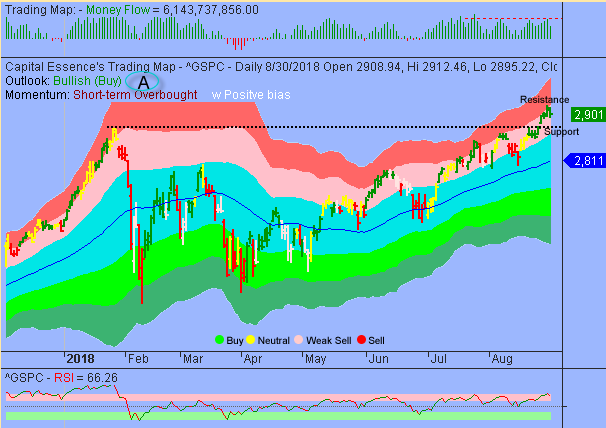 As expected, S&P retreated to support at the important sentiment 2900 mark after recent rally ran out of steam near the lower boundary of the red band. The late day rebound indicated the support would hold, at least for the time being. Market internal has been weakened but downside momentum does not appear strong enough to generate a widespread breakdown. Money Flow measure flashes a weak bull signal as it trended lower from above the zero. The indicator printed a lower high as prices broke out to new highs this week, indicating less money’s chasing stocks higher. These elements will negatively affect trading sentiment over the coming days. With this in mind we’d look to reducing exposure into overbought strength. In summary, S&P will have a downward bias heading into the end of the month, pressured by short-term negative momentum but we expect support at the important sentiment 2900 mark to remain largely intact. There is a high probability that market is in for a ‘range-bound’ trading environment. This is a rally and retreat environment. It is not a trending environment. Short-term traders can anticipate continued volatility with rapid up and down moves in the markets.